Our lives continue to unravel as things we believe in disintegrate before our eyes. Institutions are failing. Personal conduct is at an all-time low. Wall Street continues to prosper as Main Street bears the financial hardship for our country. What is needed, however, is a different kind of leader during these times of uncertainty. How can you become a stronger, more effective leader? Leadership development expert and international change agent, Dr. Daryl D. Green, lectures and writes on contemporary issues impacting individuals, businesses, and societies across the nation. He is the Dickinson Chair of Business professor at Oklahoma Baptist University in the Paul Dickinson College of Business. In 2016, Dr. Green retired from the DOE, where he worked in the Environmental Management Program for over 27 years. Before his 30th birthday, he had already managed over 400 projects, estimated at a total of $100 million dollars. Thus, Dr. Green is a proven management strategist who deals with a variety of complex projects. He has over 25 years of experience in assisting organizations and individuals with making good decisions. Dr. Green is a recognized researcher and problem solver. He has contributed to the scholarly research within his discipline with more than 15 articles published in well-known academic journals. Additionally, Dr. Green is a member of editorial boards in several academic journals, including Strategic Leadership Review and Management and Economics Research Journal. Dr. Green holds a doctorate in Strategic Leadership from Regent University, an M.A. in organizational management from Tusculum College, and a B.S, in Engineering from Southern University. Additionally, academic coursework has been done at the University of Tennessee, Nova Southeastern University, Southern New Hampshire University, and the University of Vermont. Dr. Green has a variety of national certifications including digital marketing and NQA-1 lead auditor. Are you looking practical solutions to your problems? 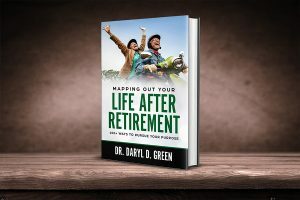 Dr. Green is an award winning author and sought after professional speaker. He is the author of several books and writes a syndicated online column on contemporary issues. Over 3,000 online publishers and content providers have used his articles around the globe. His Family Vision column, syndicated through the National Newspaper Publishers Association, reached over 200 newspapers and more than 15 million readers across the country. Dr. Green has been noted and quoted from various media outlets including USA Today, Ebony Magazine, and Associated Press. , deals with a variety of complex projects. He is the Dickinson Chair of Business professor at Oklahoma Baptist University in the Paul Dickinson College of Business. In 2016, Dr. Green retired from the DOE, where he worked in the Environmental Management Program for over 27 years. Before his 30th birthday, he had already managed over 400 projects, estimated at a total of $100 million dollars. His technical experience includes program management, engineering, project management, waste management, environmental restoration, research and development, marketing, and technology transfer. He has over 25 years of experience in assisting organizations and individuals with making good decisions. His primary research areas are leadership, management, culture, and decision-making. Dr. Green has contributed to the scholarly research within his discipline with more than 15 articles published in noted academic journals. Additionally, Dr. Green is a member of editorial boards in several academic journals, including Strategic Leadership Review and Management and Economics Research Journal. For his literary contribution to society, Dr. Green was recognized as one of the first recipients of the Amber Communications Group, Inc. / Blacks in Government – Greater Orange County Chapter’s Annual Literary Awards. He is the author of several books, and writes a syndicated online column on contemporary issues. Over 3,000 online publishers and content providers have used his articles around the globe. His FamilyVision column, syndicated through the National Newspaper Publishers Association, reached over 200 newspapers and more than 15 million readers across the country. Additionally, Dr. Green has been noted and quoted by USA Today, Ebony Magazine, and the Associated Press. He also served as a freelance writer and guest columnist for various publications including Knoxville News Sentinel, Knoxville Enlightener, Discovery Magazine, and the IEEE Technology and Society Magazine. Furthermore, he has also been a special assignment reporter for the BIG Bulletin/Reporter. He received a B.S. in Mechanical Engineering from Southern University, an MA in Organizational Management from Tusculum College, and a doctoral degree in Strategic Leadership from Regent University. He also attended the University of Tennessee, taking a number of credit and non-credit courses. Additionally, Dr. Green has taken advanced graduate studies in marketing from Southern New Hampshire University. He is a past talk-show host, a nationally recognized lecturer, nationally syndicated columnist, and personal advisor. These experiences place him in a unique position for understanding emerging trends. Estraletta A. Green, PMP, REM, Chief Executive Officer (CEO), is a native of Mobile, AL and a community activist. She is currently an Oklahoma resident by way of Knoxville TN, where she resided for over 20 years. She received a Civil Engineering degree from Southern University and completed graduate coursework at the University of Washington in Engineering Management. After graduation from college, Estraletta worked with one of the top environmental agencies in the Federal government where she served as acting team leader, responsible for managing the Hanford Site Infrastructure Program. Pursing her interest in helping others she became involved in-service organizations at work and in the community as she managed her work responsibilities. Over the course of her career with the Department of Energy, she managed numerous multi-million dollar projects, from conceptual design through definitive design including oversight of construction activities. As a Registered Environmental Manager, she was responsible for administration and coordination of required environmental project documentation. Certified as a contracting officers’ technical representative, she provided project management direction on technical project scope, budget and schedule. Tracking all baseline changes, she worked with the team to communicate and resolve issues preparing weekly written status reports and oral presentations for updates. Estraletta’s accomplishments have been recognized as she was featured as an Outstanding Black Female Engineer, selected as a delegate to the Management Institute for Professional Women and received both private and non-profit organization service awards. She continues to be very active in her community supporting various organizations. Estraletta has served in various leadership roles on the local and regional levels as a member of the Federal Women’s Program, Delta Sigma Theta Sorority, Inc., Toastmaster International Inc., Greater East Pasco Achievement Program, and Knoxville Chapter Jack and Jill of America, Inc. and as a Commissioner with the Knoxville Martin Luther King Jr. Commemorative Commission.